The ultimate experience in world travel, Lakani Private Jet Tours include everything you can possibly imagine in a luxury journey, and more! No request is too big, too small, or too difficult because we are devoted to making your travel experience special and unforgettable. Sink into luxury in your leather club seat on your posh VIP Private Jet. The jet which usually seats more than 40 passengers, is custom-fitted for a maximum of 15 travelers. Your hand-picked cabin crew anticipates all your in-flight needs, while serving first class cuisine with fine wines and champagne. Experience arrivals like royalty, often at private terminals where customs and immigration formalities happen before you realize it. Lakani learned a long time ago the value of traveling in small groups (15 – 18 travelers). It makes it possible to stay in boutique hotels/ lodges and allows suites accommodations for all. Become immersed in the sights in your window seat on your small luxury vehicle. And you’ll be totally spoiled with such a small group with whom to share your guide and tour manager. You’ll enjoy private parties, exclusive cultural encounters, and behind the scenes experiences. Luxuriate in sumptuous suites in hotels and lodges chosen for their proximity to wildlife, historic treasures, and cultural attractions. Delight in the special features of each place, whether it is private plunge pools, spectacular sea views, gastronomic specialties, or unrivaled service. You can be sure that you will be comfortable, secure, and will have an extraordinary experience. One of the pleasures of traveling is the freedom to sample culinary specialties of each region. Sometimes you just want to sit in a charming bistro, or you may wish to experience fine dining in a local restaurant, or perhaps enjoy your meal in the comfort and privacy of your room. We designed our Dine by Choice program with all those freedoms in mind – so that you can enjoy your trip in your own way. Consider your Lakani Tour Manager your concierge, who will take care of your every need all along the way. From restaurant reservations to finding that special gift, your concierge is on hand to help you. 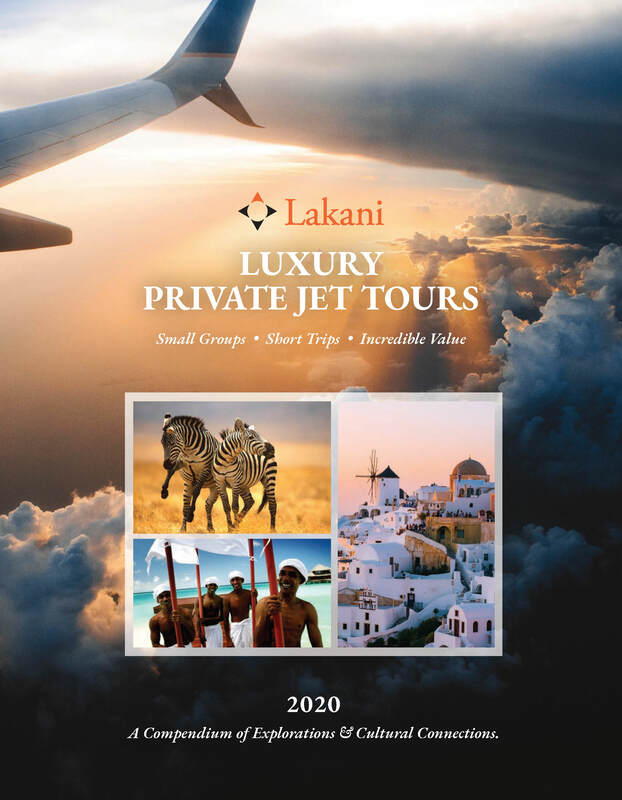 With decades of experience leading private jet trips, the Lakani Tour Managers are experts at making sure that you get the most out of your vacation. Imagine not having to worry about your luggage from the time you join the tour until the day you say goodbye to your newfound friends. Lakani is aware of the hassle of taking care of your luggage, and you can rest assured that your belongings will be safely handled and delivered directly to your room without you having to lift a finger, leaving you to enjoy the journey. Immerse yourself in the natural wonders, diverse wildlife and a rare, exclusive experience with andBeyond. Explore world-famous art; enjoy stunning sea views; and indulge in culinary delights of Europe. Discover a fascinating mix of cultures, landscapes, and wildlife on this unusual private jet journey to the UAE and African continent. Immerse yourself in the culture and history of some of Europe’s little known treasures on this extraordinary journey.